Arseli Dokumaci is a Fonds Québécois de Recherche sur la Société et la Culture (FQRSC) postdoctoral fellow at McGill's Social Studies of Medicine Department. Her work focuses on the intersections of disability and performance, with an emphasis on everyday life performances, visual ethnography and measurements of disability in medicine. As part of Disabilities Awareness Week (March 23-27), she will participate in Media@McGill’s panel on Radical Affordances, whose title is inspired by her own research in the area of critical disability studies. 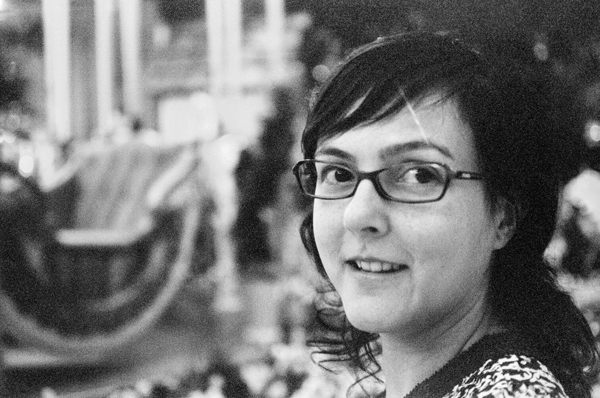 Arseli Dokumaci is a Fonds Québécois de Recherche sur la Société et la Culture (FQRSC) postdoctoral fellow at McGill’s Social Studies of Medicine Department. Arseli Dokumaci is a Fonds Québécois de Recherche sur la Société et la Culture (FQRSC) postdoctoral fellow at McGill’s Social Studies of Medicine Department. She received her PhD in performance studies at Aberystwyth University and completed postdoctoral research at Concordia University’s Mobile Media Lab, where she still works as a research associate. Her work focuses on the intersections of disability and performance, with an emphasis on everyday life performances, visual ethnography and measurements of disability in medicine. As part of Disabilities Awareness Week (March 23-27), she will participate in Media@McGill’s panel on Radical Affordances, whose title is inspired by her own research in the area of critical disability studies. Can you describe the provenance and meaning of the notion of “affordance” as it pertains to your research? The notion refers to possibilities of action offered by the environment. It originally comes from ecological psychology. But a variety of fields have taken it up since then, such as design and human computer interaction. What struck me was that there was hardly any work done on how affordances and disability may connect with each other, and this, despite their extreme relevance. So what I did in my doctoral and postdoctoral projects was to develop a research program that considered affordances from the lens of disability. I began my research by asking: What if we think of disability not as the negation of an affordance but as an affordance in and of itself? With this question in mind, I embarked on my fieldwork, filming the everyday practices of people with various forms of disabilities. After having been in the field, working together with my research participants – who were very generous and articulate – I came up with this argument: Disabled people – whether they are disabled by an illness, chronic pain and/or the barriers of their environments – relate their bodies to the surfaces and substances around them in highly creative ways. These improvisations not only allow them to feel as little pain as possible, or to skilfully detour around obstacles; they also let their bodily differences, pain and discomforts be expressed in the form of an otherwise unimaginable affordance. These new affordances turn able-bodied norms upside down. They defy the physical, mental and attitudinal moulds into which our bodies are expected to fit. They open up other ways of moving, sensing, acting and being in the environment that we all share. In what ways does the application of affordance theory in the field of critical disability studies have radical potential? Well, it goes without saying that anyone, disabled or not, can come up with new ways of doing things. Everybody has their own affordances. In the case of disability however, affordance creations have a distinctively radical character. These affordances are not simply a matter of inventing day-to-day strategies and trying to make one’s life easier and more convenient when this life is already provided with the basics of subsistence, and lived in health and free of pain. Disabled individuals’ affordances are for being able to live such a life to begin with. They improvise other ways of affording the everyday when illness, pain and suffering gradually deprive the body of its resources. They compose new choreographies of daily movements so as to be able to access the basic rights and privileges that everybody else has. Their affordances are their own means of literally setting the grounds for their mobility and actions when the social life fails to provide them on their behalf. So these affordances are not yet another example of extraordinary human resilience. Instead, they are claims made towards collective living. They question the terms that we, as a public, have somehow come to agree upon about how we share our resources, infrastructures and systems of sustenance. They challenge the norms that mediate what our bodies can or cannot do, how they should be lived and perceived. They concern the ways in which we attend to another human being’s pain and care for each other. This is why I consider these affordances as potentially transformative actions in the world. My application of affordance theory within the context of disability aims precisely at addressing this radical potential. In your previous appointments, you conducted ethnographic research on disability, performance, and everyday life. What were some of the novel uses of media you encountered while conducting this research? I believe that disability is very much about what gets buried in the banal minutiae of everyday life. Be it a vanishing gesture, a detail of architecture, an unnoticed feature of an object or an extraordinary choreography of an ordinary action… When I follow my research participants, filming their mundane gestures, movements and encounters, I am after exactly these fleeting moments and details. Where, when, and how do they occur? How can I locate and capture them in their actuality? This is where the camera comes in most useful in my research practice. It enables me to seize what otherwise disappears in the ephemerality of actions and mundane details. What the banal renders invisible, the media help make visible again. The video-editing process also offers a variety of technical possibilities, such as zooming in on details, repeating sequences, calculating time and juxtaposing differences. I use these specific affordances of the editing process as a counter-action to what public consciousness ignores on a day-to-day basis. That is, the obstacles of everyday life and affordance-creations of disabled people. Your current research appears to be taking you in a new direction. Can you briefly describe what you are now working on within the Social Studies of Medicine Department at McGill? My previous work was about understanding disability as ingenious ways of performing daily tasks, and exposing these mundane performances as “affordance creations.” My current work still revolves around disability and performance, but this time from a different perspective. At the moment, I am writing a history of disability measurements in medicine. I started with the interwar period and plan to end with the emergence of “quality of life” assessments. What I have been able to track down so far, however, indicates that there is a strong and very intriguing link between my previous and current work. In the histories of disability measurement that I traced, I find that an idea of performance has been central to them from the very beginning. This concept of performance relates to “function,” as opposed to the making of a radical affordance, as was the case with my previous research. I am very interested in further exploring how these two projects may in the end come together. For more details about the 23 March 2015 panel on “Radical Affordances: Emerging Scholarship, Art, and Activism at the Intersection of Media and Disability Studies,” visit media.mcgill.ca and www.radicalaffordances.ca. Go here to view videos made by Arseli Dokumaci.